During a joint replacement operation (also called arthroplasty) some, or all, of a damaged or diseased joint is replaced with an artificial one. It is usually done when a joint has become very painful, is causing disability, and can no longer be managed with nonsurgical treatments. Hips and knees are the most common joints to be replaced. 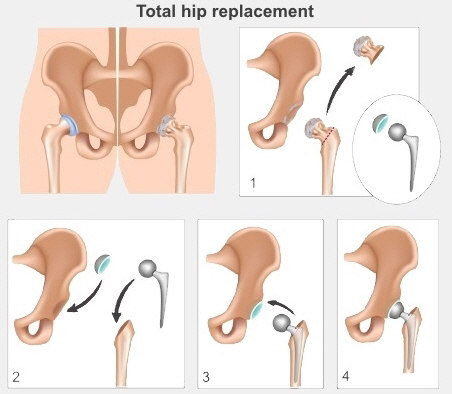 The NHS website has good sections explaining hip replacement and knee replacement. Will I get publicly funded joint replacement? If your doctor thinks you need a hip or knee replacement and you meet certain criteria they will refer you to an Orthopaedic surgeon. Your doctor will make sure you have tried non-surgical treatment options first as many people with hip and knee problems can manage well by making lifestyle changes. If you don't meet the criteria for a joint replacement, you may be referred to a dietitian for support to lose weight, physiotherapy, or green prescription. If you want surgery before it is available through the public system, talk to your GP about being referred to a private orthopaedic surgeon. The ERAS booklets on Before & after hip & knee replacement surgery have information about what to expect after a hip or knee replacement. Your surgeon will normally see you again four to six weeks after your hip or knee replacement. By then, you should have been able to resume most of your normal daily activities including walking without a walker or crutches, and showering. If you drive, you may be back driving. If you work, you should be able to return to work. Talk to your GP or physiotherapist if you are still having problems with daily activities, or if you want to want to restart a strenuous activity or sport. It might help if they design a specific exercise programme for you. Written by Burwood Orthopaedics team, Canterbury DHB. Adapted by HealthInfo clinical advisers.Last reviewed March 2018. Last updated March 2019.